Click here for more detailed and quite magical directions on how the Spoon Mage™ creates a perfect pie crust. One of my favorite vinegars to use for this is Champagne Vinegar. Cut the shortening to the flour until the mixture is reduced to evenly sized tiny little balls that are smaller than peas. Add the egg vinegar mixture to the flour. Stir just to the point of where it is mostly mixed in. Add water, a tablespoon at a time, stirring only until all the dry particles are moistened. Sprinkle flour on the rolling surface and place one ball in the center of the flour. Sprinkle a bit of flour on top. 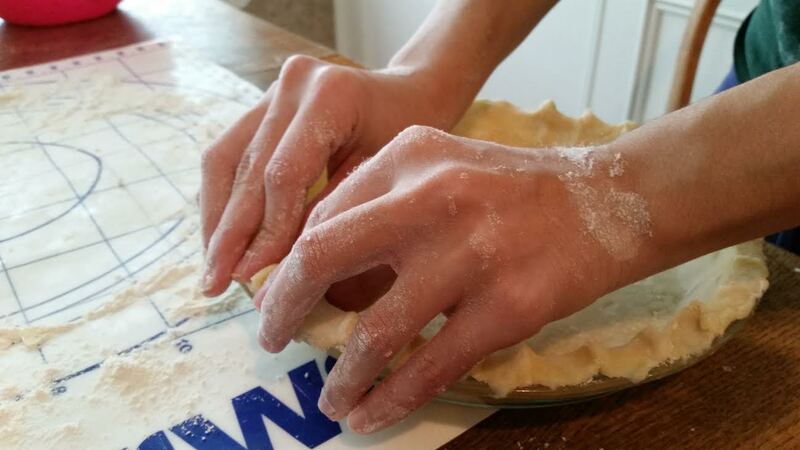 Use your hands to flatten one ball out into a reasonably round shape, and roll, turning frequently until the dough is slightly larger than the pie pan. Spray a pie pan with cooking spray and center the dough into the pan, press slightly. Flute, or crimp, the edges if your pie only uses one bottom crust, fill, and bake. Otherwise, after filling, top with the second crust and flute the two crusts together. Remember that you can amend the crust with a touch of water and an extra bit of dough as needed. If you put a top crust on the pie, cut some nice decorative and functional steam vents in the top crust. Now, let’s make a pie! How about a nice Apple Pie? Or if savory is what you want, try making your very own Chicken Pot Pie! 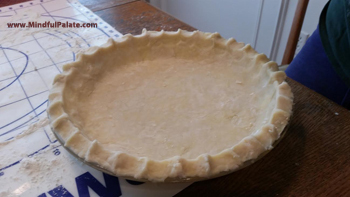 This entry was posted in Dessert and tagged basic, Crust, easy, fluting, how to, pie. Bookmark the permalink.